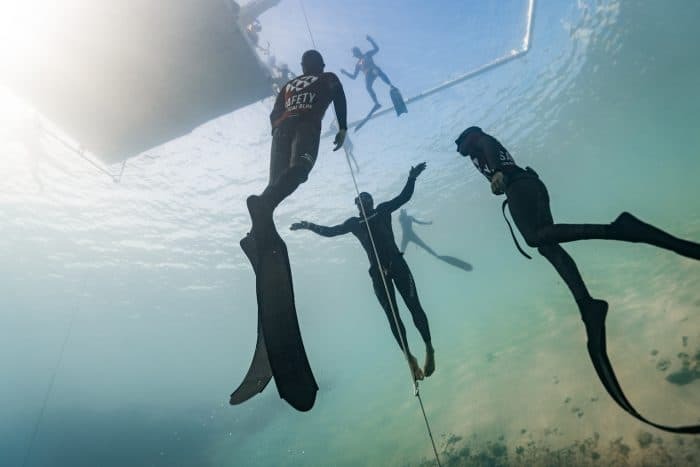 The weather gods at Deans Blue Hole seemed to be more cooperative on day two of Vertical Blue 2017 (#VB2017), and after a capricious start to the international event, the preceding day, the diving, the divers and the wind seemed to calm down a bit. With only 18 announced performances, the mood was calmer and the schedule less hectic, which was manifest by the 8 clean & consecutive white card performances in the first session of the day. The day ultimately revealed another five national records for Italy, Mexico, Germany and New Zealand. 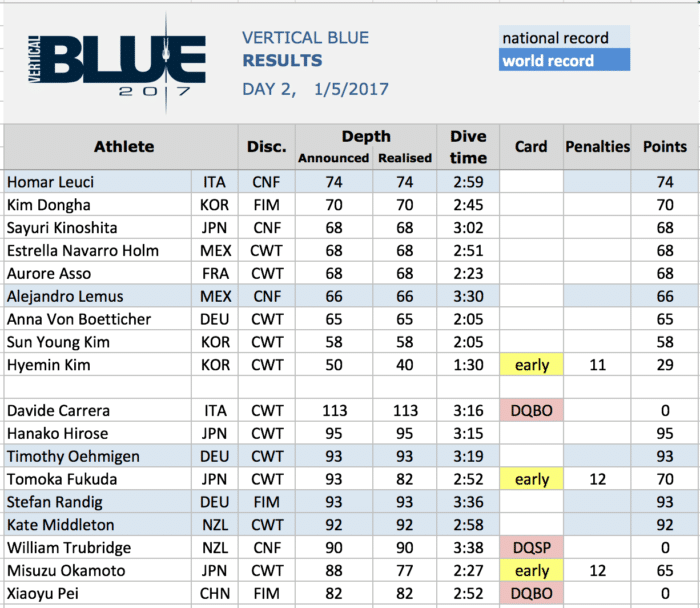 “Due per Due!” beamed Homar Leuci as he nabbed his second new national record in as many days. 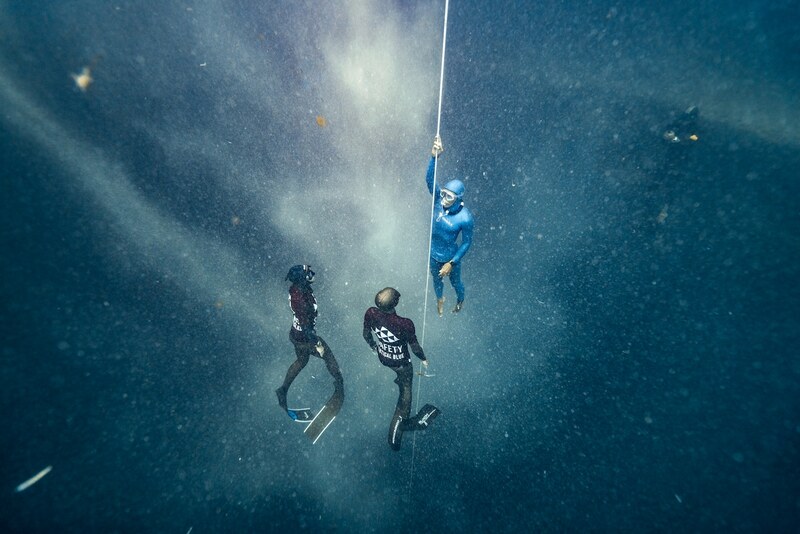 The next record-setting dive for Alejandro Lemus, however, did not feel nearly as pleasant. Today was a great day for Germany, both Stefan Randig and Timothy Oehmigen successfully executed white card dives to take home titles in FIM and CWT, respectively for Deutschland. As for Stefan he surfaced looking like James Bond and confessed to having his eyes closed all the way down. Stefan’s business partner at Freedive Panglao “DK” Dohnga Kim of Korea also made his first dive of the comp today and came up clean from a 70m FIM dive to happily receive a white card. The “great” Kate Middleton of New Zealand, (by way of Freedive Gili in Indonesia), ascended with clarity, speed, and strength. 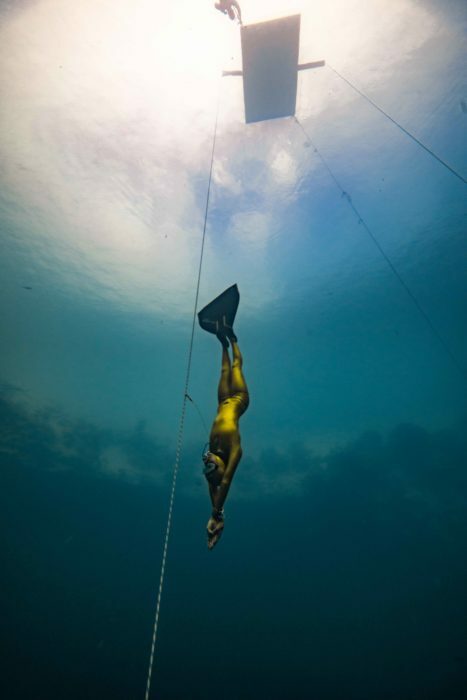 What makes her new national record dive of 92m CWT even more spectacular is the fact that it is a personal best, and there’s nothing better than a juicy PB! 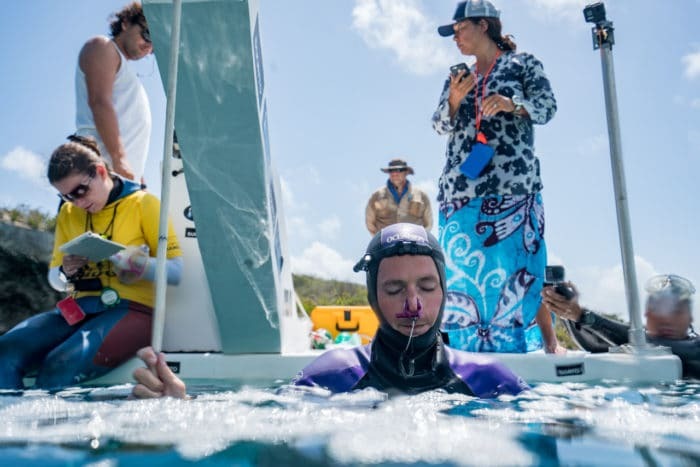 Event organizer William Trubridge, was not as lucky as his fellow Kiwi, after completing a monster no-fins dive to 90 meters, the 18x world record holder was a tad hypoxic and ended up dipping his lip into the water during his surface protocol, and was then DQ’d by the judges who sadly handed him a red card. 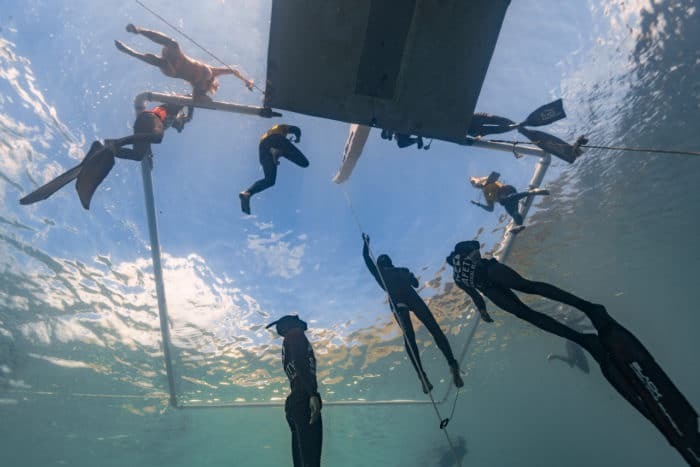 But with seven more days of diving to come, we’re pretty sure Trubridge will make up for any short-term misses. The official Top Times for Day Three are out and it promises to be a doozy! 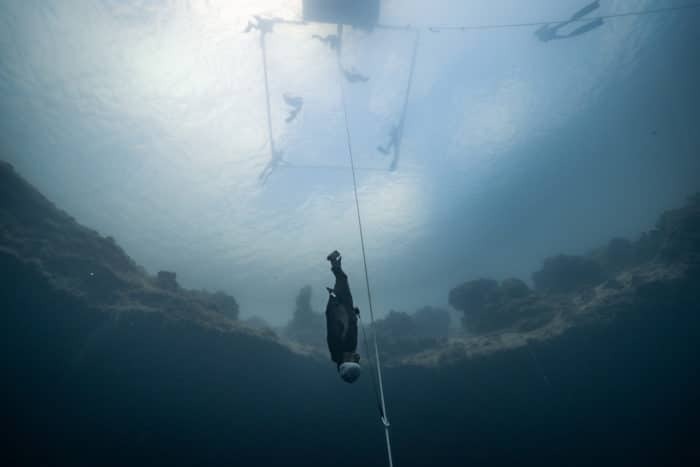 A World Record attempt for the ladies by Alessia Zecchini to 102m CWT and a huge dive announcement by Alexey Molchanov. 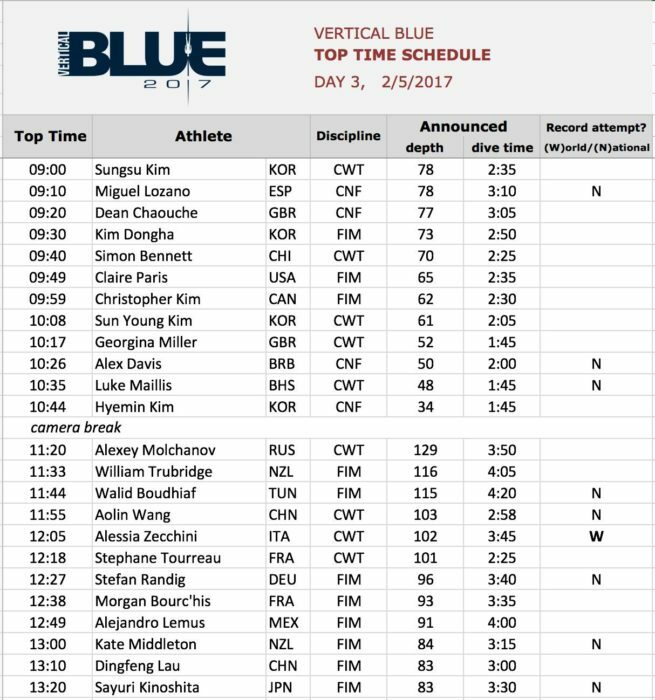 Tune in to see all of the live feeds on the Vertical Blue facebook page and see live results posted on the #VB2017 website. 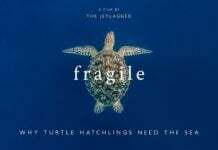 Stay tuned to DeeperBlue.com for breaking news and coverage of the event.